There are currently 31,358 users on this website. Can someone please tell me what this is called. Thank you. I've seen it on a few half dollars. Thank you. 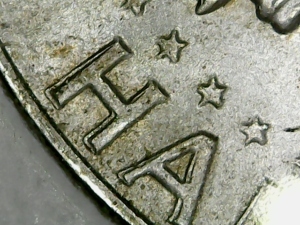 An overall view of the coin could help, but I see what looks like Machine Doubling on the letters in this close-up. Just Machine Doubling. Fairly common. You'll come to recognize this easily in time. Image the strike happens and after the strike, the machine takes a slight sideways movement. So the strike is altered by die damage making it look just like your coin. So the devices are not doubled, but reduced from coin damage. You can keep it as a reference piece.